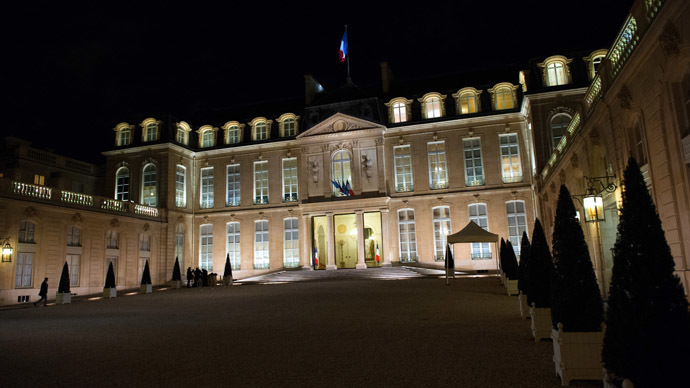 A motorist has deliberately driven at and injured a policewoman outside French President Francois Hollande’s residence, according to French media. It was not immediately clear if the incident was linked to the fatal shooting at the offices of satirical magazine Charlie Hebdo on January 7, and comes amid a high security alert in France. Motorcycle police have detained two 19-year-old men – the driver of the vehicle and one of his passengers. Also, there is a manhunt on for two others, believed to be a man and a woman, France24 reported. The driver had low levels of alcohol in his blood, but wasn’t over the legal limit, police said. Eyewitnesses say the driver deliberately ran over the policewoman. "She [the injured policewoman] says that the driver looked at her in the eye and did not pull on the brakes, and that he voluntarily hit her. Three witnesses nearby say the same thing," a delegate of the police union Alliance, Stephanie Weber-Boyer, told Europe 1. The officer was taken to the hospital and will be monitored for some time, according to iTV. Hollande was quickly at the scene of the events. The victim was thrown onto the hood of the car, and her shoulder and wrist was slightly injured, according to France Info. "My colleague, who was a guard at the Elysee Palace, noticed a vehicle that was moving the wrong way. She approached. The vehicle hit her deliberately. My colleague fell on the hood of the car… and then fell to the ground," Weber-Boyer said.